We are only a week into the season, but there are already a lot of exciting backcourts to talk about around the league. Most of these guard combinations are new as of this year or were formed last year. Some of these pairs contain veterans; however, the majority of them are very youthful. All of these duos cause problems for their opponents. Don&apos;t forget: we are now in a new era, where the league is run by a plethora of point guards. These days, it is very infrequent to find a team with an elite shooting guard to accompany a good point guard. With some of the talent that has entered the NBA in the last couple of years, we are now witnessing teams that look to individual players to dominate at these two positions. Taking into consideration their current capabilities, as well as their future potential, here are the best backcourts in the NBA. Teams that just missed the top 5: Cleveland, Golden State, and the Portland Trailblazers. With rookie Dion Waiters joining Kyrie Irving in Cleveland, this backcourt may soon break their way onto this list. Although Irving is coming off of a rookie of the year performance and will likely make the all-star team in his second year in the league, he must continue to get better and Waiters will need to prove that he was worth being taken 4th overall. Steph Curry and Klay Thompson are also two young guards on the rise. They are as explosive as any pair of 3-point shooters in the league. If Curry can stay injury-free and Thompson can develop into an elite two-guard like Warriors hope he will, this pair will bring the bay-area franchise back into the playoffs and league relevancy. The Portland Trailblazers may have come away with the steal of the draft. Taken sixth overall, Damian Lillard has a real chance of being rookie of the year. He has proven so far that he is among elite company. He becomes only the 3rdplayer in NBA history to score 20 points and 10 assists in his first two games of his career, joining Oscar Robertson and Isaiah Thomas. Lillard has the potential to be an all-star point guard in a couple of years and with hard-nosed defender/3-point specialist Wesley Matthews alongside him, this duo is already giving teams headaches. 5.Dallas Mavericks: Darren Collison and O.J. Mayo. Both players were brought to Dallas this offseason in an overhaul of the franchise, but Mavs fans should like what they see so far. Mayo is scoring 21.5 points per game so far on over 50% shooting from the field. Combine that with Collison’s 16.5 points and 8.5 assists on over 60% shooting and they may be playing better than any backcourt so far. These two are seeing increased roles on this Dallas team but they must be able to sustain these kinds of performances. They will likely continue to carry the scoring load for this team as Dirk Nowitzki gets back into playing form, but expect to see a their scoring averages fall a little as the season progresses. 4. Milwaukee Bucks: Brandon Jennings and Monta Ellis. This pair came together late last season, giving the Bucks a shot at beating any team on any given night. No backcourt will put more points up on the board than these two. That’s what they do. Ellis has averaged right around 20 points per game for his career; and Jennings is coming off his best season where he was also at about 20 points a game. So far the pair looks to be meshing well as Jennings’ assists averages are at a career high 13 a night. This is only after two games but we can see how deadly they can be. With motivation to play defense these two are impossible to deal with. Jennings is the current league leader in steals at 4 a game but they will both need to prove that they are willing to bring it every night defensively. Either way, the exciting Milwaukee backcourt is one to keep an eye on. 3. Houston Rockets: Jeremy Lin and James Harden. I may tell you that Jeremy Lin is a very good player, but I will not say that he is a top-ten point guard. Not right now. The fundamental query will be to see if Lin can live up to the ridiculous performance he put on in New York last season. After 3 games, the Rockets are off to a great start. Lin has been able to score the ball at just over 15 points a game, has had at least 7 assists each night, and is showing he can both rebound and make plays defensively. And then there is the beard; James Harden is off the charts right now. He exploded onto the scene in Houston with his debut of 37 points, 12 assists and 6 rebounds. He followed up on that performance by dropping a career high 45 points to go along with 7 assists. Harden is the league leader in points after 3 games at 35.3 a game. Harden will make his first all-star appearance this year and will give his former teammate Kevin Durant a challenge for the scoring title. Houston looks to be in a great position as both Lin and Harden have games that complement each other very well. Both can score; both can pass; both rebound well for their respective positions; and they both play hard on the defensive end. At the end of the season they could be #1 on this list. 2. Denver Nuggets: Ty Lawson and Andre Iguodala. The Nuggets acquired the veteran Andre Iguodala as he was in London this offseason playing basketball for the United States Olympic team. Andre is coming off his first all-star appearance last year in his eighth season in the NBA. Now with an Olympic gold medal, Iguodala is one of the most proven shooting guards in the league. He can do everything. He rebounds extremely well as a guard, he is as tough as they come, a great defender, one of the best players in the open floor, and can score when you need him to. Ty Lawson is a perfect match with Iguodala in Denver as this combo will look to run, run, and run. George Karl wants to see his team utilize their superior speed and athleticism every night. Lawson has a surplus of options with how deep this Nuggets roster is. Lawson is a very good point guard. He will soon be considered among the league’s best at his position and will push to become an all-star. This season should be an exciting one for Denver fans. 1. Brooklyn Nets: Deron Williams and Joe Johnson. Hello Brooklyn! This is what many fans have been waiting for. The nets are back to being relevant. Not only that, they have the most acclaimed starting backcourt in the league. Joe Johnson is a six-time all-star and has an opportunity to be a part of a very special movement in Brooklyn. 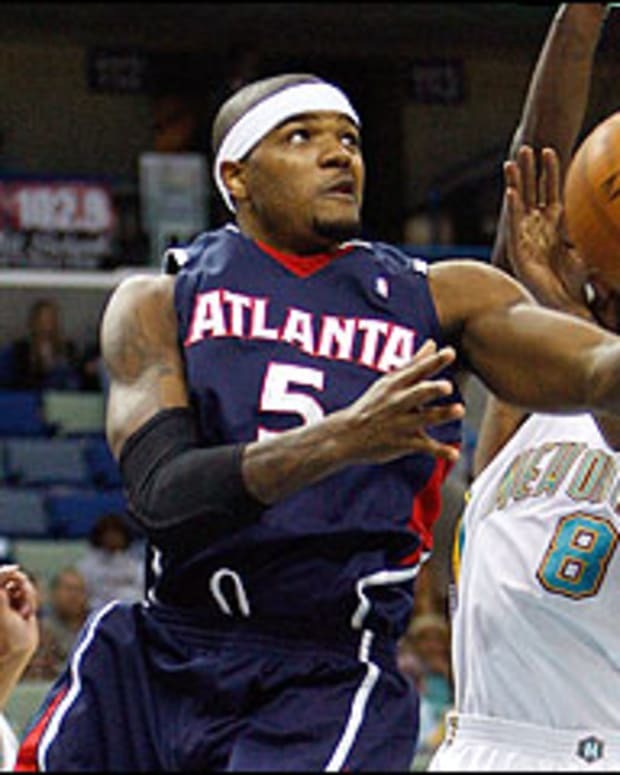 In the 2006-2007 season Johnson averaged 25 points per game. But since then he has seen his numbers slowly decline. He remains one of the best shooting guards in the league and by teaming up with Deron, Brooklyn fans hope that his game will be refueled and power this new Nets team into the Playoffs. Deron Williams is arguably the best point guard in the world. If you believe its Chris Paul, then Deron Williams is second. He is the centerpiece of the Brooklyn franchise now and for the future. This superstar guard is a two-time gold medalist and three-time all-star. Brooklyn needs him now more than ever. Deron’s first priority is to get this team into the playoffs. Then he will look to build on his career and turn this team into contenders. The road is going to be a tough one for the Nets, but if there is anyone who can get them there it is Deron Williams. 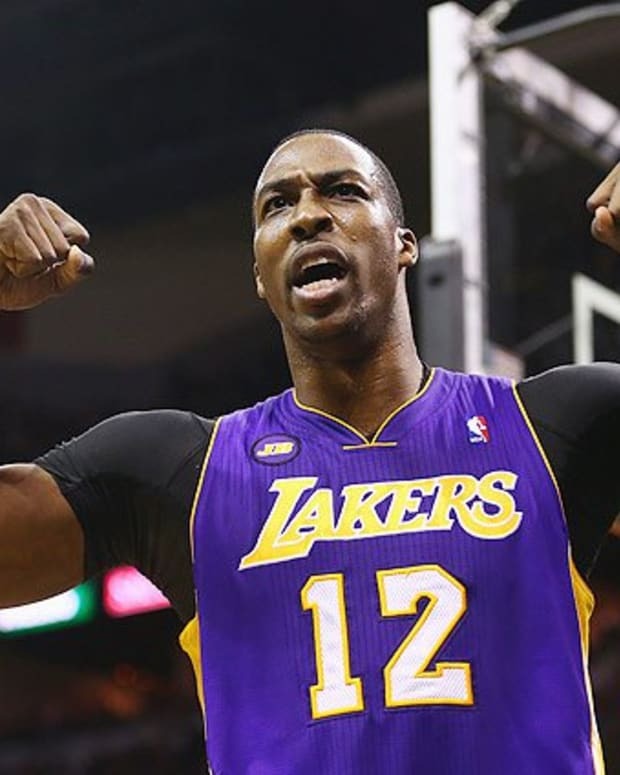 NBA Rumors: Dwight Howard More Interested in Rockets, Mavericks than Lakers?